You can come to South Africa for a holiday or business and rent a car, but then you would have to find your way around from the first day. Yes! you can use Google maps, but as we know it always takes the most direct route (which is okay if you’re local, a bit daunting if you have no idea where you are and just want to start relaxing after arriving). Imagine you could have a driver in any car you choose to take you around for a few days, till you felt comfortable about your surrounds. That would be so much better and relaxing (getting the lay of the land before venturing out). Just takes the edge off getting around to places the first time, so you can figure out where everything is. How to get around and out of the city to some of the different sites, that’s where you want to be. Just like a local and it will make the second and third weeks on your holiday way easier and relaxing. So it’s simple, as the worry is taken out of driving in a new city. 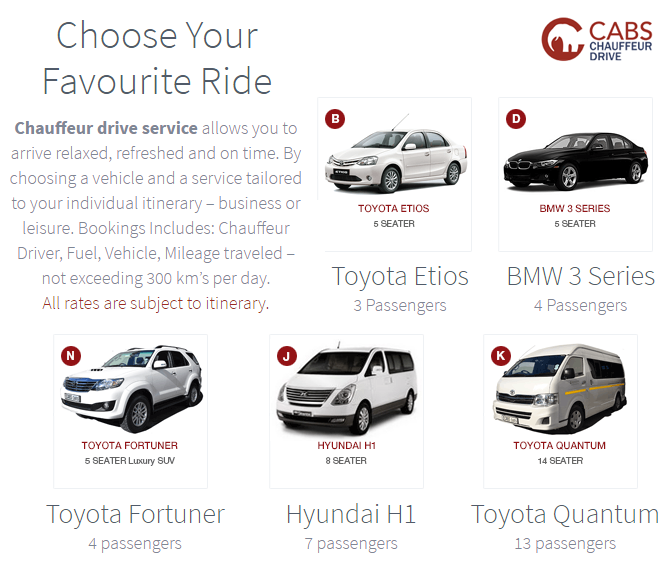 The Chauffeur drive service allows you to choose from 5 different groups of cars, a simple 3 passenger Toyota, 4 passenger luxury car, maybe a 4×4 to head out to the game reserve, or the bigger vans to take 7 to 13 passengers so you can travel with friends and family. You choose the vehicle and CABS supply’s the local chauffeur that knows his way around and can take you directly to all the tourist places or some local hangouts. Along with the booking, you can also have an itinerary drawn up for you to visit places further out of the city. Below is an example of the one for a 2-day trip to Hermanus in the Western Cape. – Leave and take the route through Mont Rochelle nature reserve, behind Hottentots-Holland Mountain Catchment Area, Pass Theewater Kloof dam to Villiersdorp and onto Arabella Country Estate spa and Golf. – Walk around Town for 2hour and stop for coffee and cake at Harbour House. – Return to Cape Town and drop off Clients at the accommodation. CABS Chauffeur Service is really the easiest way to get around with an organised itinerary and a local guide with knowledge of places you want to visit. The benefits are the convenience, productivity, time savings, and driving safety for those corporate business people, events leisure groups or just simple holiday makers that could make use of the relaxed Chauffeur service for their entire holiday period. Imagine a sightseeing tour through South Africa on an itinerary that’s being drawn up just for you. Available to you in Durban, Port Elizabeth, Johannesburg and Cape Town. For more info, check out CABS Chauffeur Drive site and do you next booking with no hassle.